If you’re planning to hit the trails this summer, make sure that you take along some sustenance so you don’t peter-out before reaching the peak. Ambrosia apples are a great choice as hiking fuel. At about 100 calories per apple, they make a nice light snack that won’t weigh you down or make you feel sluggish. Unlike sugary snacks, Ambrosia apples offer sustained energy. These apples contain fructose which slowly metabolizes over an hour or so instead of delivering the sudden energy jolt (followed by a crash) that you get from sugar. Ambrosia also have natural anti-inflammatory properties (quercetin) which should help decrease muscle pain and will also help you recover faster after your hike. Plus, Ambrosia apples make a super tasty treat on the trails. Here are a few ways to take Ambrosia along on your next trek (big or small). Dried or dehydrated Ambrosia apples pack up very nicely and are easy to eat (even while walking). Ambrosia apples are easy to bake into chips – in fact, here’s a recipe we shared a little while back on our blog. You can also slice them and pop them into a dehydrator for a similarly convenient and delicious trail snack. Trail mix is the go-to snack for any hiker. The beautiful thing about trail mix is that it can be any mix of ingredients you love. Add Ambrosia apples to your favourite blend by baking apple chips or using dehydrated apples and chopping them up into little cubes. The flavour of Ambrosia apples goes really well with nuts as well as with other dried fruit like cranberries and cherries. Another great way to take Ambrosia along on a hike is by turning it into fruit leather. It’s easier than you think to make yourself! Check out this blog to find out how. The great thing about fruit leather on a hike is that you can eat a little at a time. 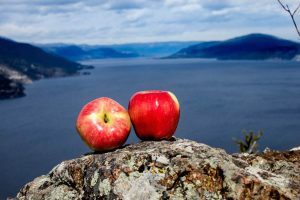 Plus, you’ve got all the great nutritional benefits of a whole apple without the weight, which is a blessing on longer hikes when you can feel every extra ounce you’re carrying! For shorter hikes, we love to take whole apples to enjoy either at the peak or a scenic spot along the way. What’s great about doing that is it forces you to slow down and enjoy the moment. Plus, you get rehydration benefits from having a juicy apple. Because Ambrosia are naturally slow to brown, you also have the option to slice them up before the hike and put them in a plastic baggie – they’ll still be fresh when you get to them.